There are 16 teams at the Vitality Hockey Women’s World Cup, London 2018, and after the first two days of action, it is clear that the competition is one of the most wide open contests in the event’s history. At the end of Day 1, England (FIH Hero World Ranking: 2) had drawn with India (WR:10); Ireland (WR:16) had thoroughly quashed USA (WR:7), and Australia (WR:5) were taken to the wire by Japan (WR:12). Only Germany’s (WR:6) 3-1 win over South Africa (WR:14) reflected the rankings. Day 2 got even more interesting as the lowest ranked team, Italy (WR:17) took Asian giants China (WR:8) apart to record a 3-0 victory. Spain (WR:11) momentarily led Argentina (WR:3) and Belgium (WR:13) were unlucky in their 4-2 loss at the hands of New Zealand. World number one side, Netherlands bucked the trend as they romped to a faultless 7-0 win over Korea (WR:9). 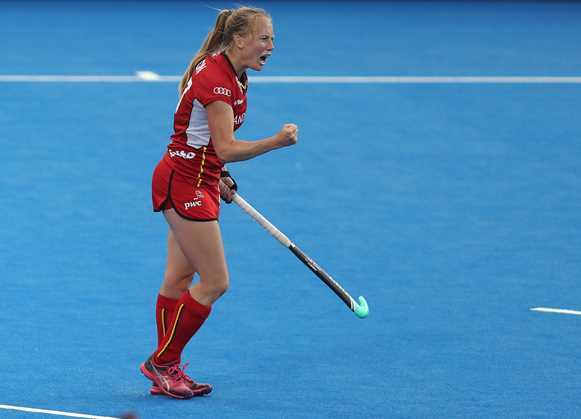 We spoke to Belgium’s Jill Boon after her team’s narrow loss to higher-ranked New Zealand. She explained that key to closing the gap between the top 10 teams and those in the ‘teens is a focus on fitness. The current Belgium team has been on an upward trajectory over the past four years. The Red Panthers finished in 12th and last place at the 2014 Rabobank World Cup in the Hague. Then they were comprehensively outplayed but now, with a silver at the 2017 Rabobank EuroHockey Championships under their belt, they are a team that oozes new found belief. “In the past we lost a lot of games because we were not fit or not fit enough but we have worked really hard in the past few years and now we are really, really fit,” says Boon. “But teams like New Zealand, well they have players like Stacey Michelsen and Anita McLaren and they are another league, in fact they are the best in the world when it comes to fitness and speed. “We have made huge steps forwards. We play with a huge amount of passion and we really celebrate every goal now. Today we lost but we also scored goals and competed and that is where we want to be. The most important game for us is against Japan so today [against New Zealand] we will take all the positives, learn from the mistakes and make progress that way. Jill Boon is one of the stars of the Belgium Red Panthers who are in action on Tuesday 24 July against Australia at 14:30 (CEST+1). For all news and information regarding the Vitality Hockey Women’s World Cup click here.